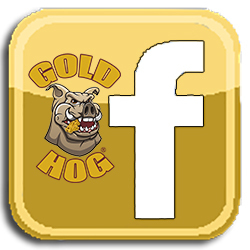 Most “minis” really perform like toys… the GoldHog Piglet performs like a small WASH PLANT. 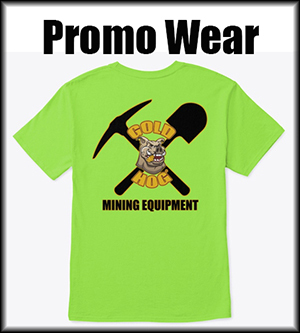 It can run 2-3 times the dirt that other minis do and is VERY lightweight and portable. Watch the video below for all the details and see the ADD-ONS below. The unit is roughly 2o pounds and the main sluice is roughly 36″ long x 8″ wide. 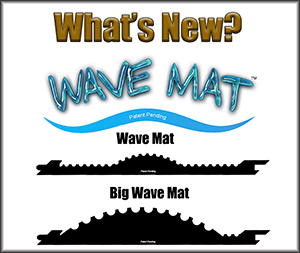 Comes with pre-made mats, legs, header box with 1.5″ plumb attachment. The clay claw and extension are optional. We do not sell pumps or hoses, instead to save YOU money we list the best way to buy them. SEE THIS PAGE for more details. There you will find a bunch of pump options and hoses. What pump to use and do you sell them? The unit really needs a min of 3600 gph at 40 psi run effectively. 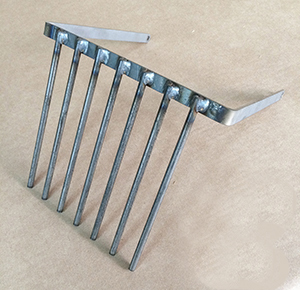 This is what gives you the DESTRUCTIVE action in the header box shown in the video. A bilge pump can be used, but the pressure / washing action will not be the same as a gas pump. Also you have to keep your hose very short. They simply have little PSI. You are MUCH better off to get a larger pump and regulate the flow via a ball value. Can you convert to a dredge? Remember…. it’s not a FULL SIZE highbanker. It’s a mini. Even though it will out perform other minis if you run it HARD and HEAVY with dirt you could always face some losses. The extension should be used if you run it hard / high volume. Should I get the extension? ORDERING – See ADD ONs BELOW. Clay Claw $49 can only be ordered by those ordering a mini. Extension with extra mats and legs $179 + $28 shipping in the U.S. If ordering from anywhere outside lower 48… please use the contact form for shipping quote. 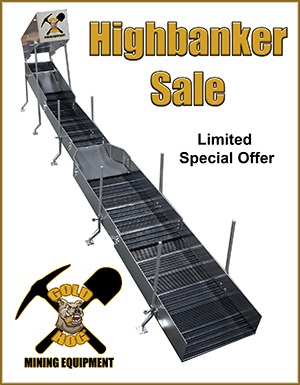 NOTE: If ordered WITH the mini highbanker we will credit back $10 on the shipping. – 8.25″ wide x 36″ long, aluminum sluice tray. 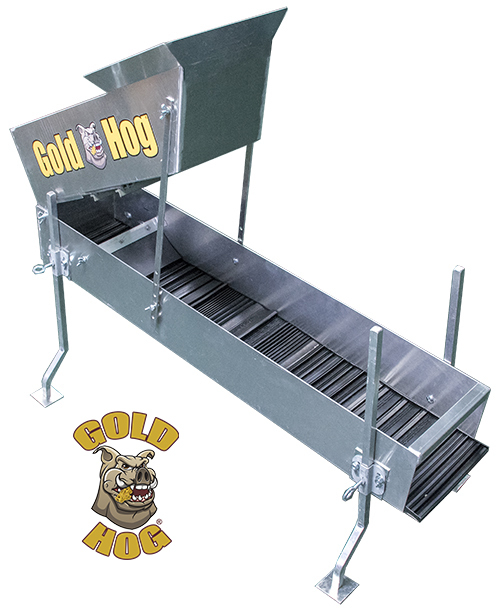 – Our Gold Hog custom designed swivel leg brackets. 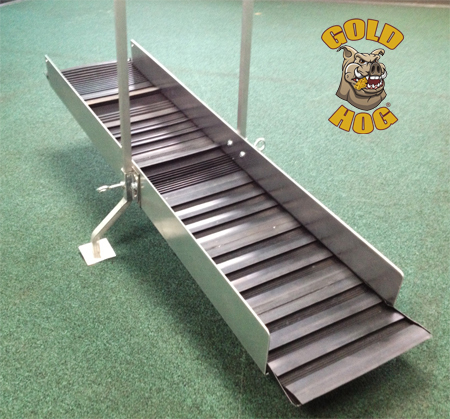 – Our Gold Hog custom made step out aluminum legs. – Nuts and bolts for all. This extension is custom made and hand finished in our shop. All holes are drilled and the unit is assembled. We also include nuts and bolts to attach to your mini. Simply drill 1/4″ holes at the end of your mini. ← click for ordering info on Amazon. For about $299 this comes with all the BASIC hoses. The only down fall of this pump is that there is no THROTTLE, so you need a ball valve to adjust the water flow.